Odds are, you’ve probably noticed the influx of solar panels popping up on homes across Andrews, TX and Roswell, Hobbs, and Carlsbad, NM in recent years. And no, you’re not going crazy — residential solar panels are on the rise in many parts of the country, and it certainly isn’t a fad. As it turns out, more and more homeowners are realizing that solar makes cents (see what we did there? ), and it isn’t just because their friends and neighbors are making the switch to solar. That being said, here are some of the reasons why so many homeowners are getting solar panels for their homes! One of the main motivators behind switching to solar power is the incredible savings you get on your energy bills — that is, if they aren’t eliminated altogether. This is because you are literally generating free power when you have solar panels for your home, as they soak up direct current (DC) energy from the sun and convert it into alternating current (AC) energy, which then powers your home. In fact, it is not uncommon for residential solar panels to produce even more solar energy than needed, which can be stored and sold to other entities. Sources estimate that residential solar panels can completely pay for themselves after as little as four years in some states, depending on the upfront cost, the amount of solar power generated, tax incentives, and other factors. In Texas specifically, the energy savings of most solar systems for homes break even with the cost of the original price of installation after 12 years and see an internal rate of return (IRR) of roughly 9.8 percent. No matter how these factors line up or how long it takes for your solar panels to pay for themselves, one thing remains the same: they will eventually, hands down. Another major reason homeowners are making the switch to solar energy is because they are offered tax incentives to do so. According to the U.S. Green Building Council, “You will get 30 percent of total system costs back from equipment and installation as a federal income tax credit when you file your taxes,” which is a huge step in the process of residential solar panels paying for themselves. In addition to this, people who have solar shingles or solar panels for their house also qualify for state rebates and Solar Renewable Energy Credits (SRECs), which refers to the income earned by selling excess solar power to utility companies in your area. Hand in hand with selling unused solar power to neighboring utility companies is the fact that homeowners who choose to go green with residential solar panels regain energy independence. This means that they will no longer fall victim to accelerating energy costs, which have risen by nearly three percent every year in the last decade, according to EnergySage. With this, homeowners that have shifted to free energy have also assisted in the greater energy independence of the U.S. as a whole, meaning that we are not as dependent on other countries for fossil fuels and are stimulating our own economy by creating more jobs in alternative energy. In case you didn’t already know, careers in the solar power industry typically pay very well and make up a significant portion of the U.S. economy, so you really are supporting local jobs when you switch to solar! We hope that this post has given you a better understanding of why so many residents in Andrews, TX and Roswell, Hobbs, and Carlsbad, NM are making the switch to solar power for their homes. 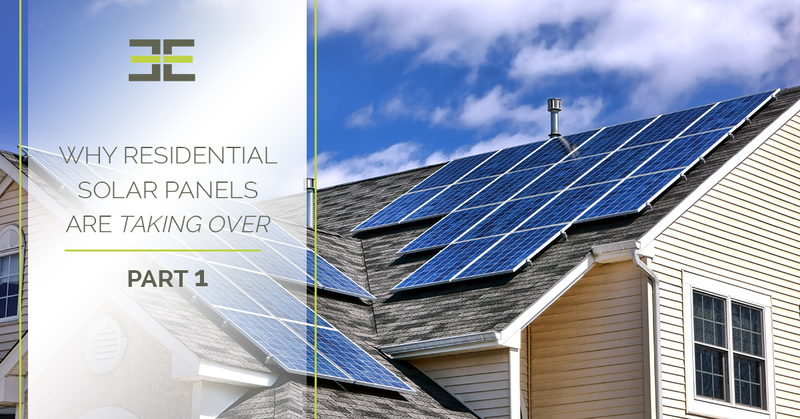 Keep an eye out for part two of this blog series, where we will continue outlining the main reasons why you’ve seen so many residential solar panels popping up all over the country in recent years. Until then, feel free to contact our solar experts at Endless Energy to learn more about the solar systems we offer, our process for solar panel installation, and more. And, if you’re ready to go green, request a free custom quote for your residential solar panels in Andrews, TX and the surrounding Roswell, Hobbs, and Carlsbad, NM areas!